Invited by NewMan’s Business Accelerator of Macedonia, I was in Skopje as the Vice President of EBAN on the 2nd of November to give a keynote speech on entrepreneurship. During this event I was interviewed by Silka TV and also met with start-ups. The event was an enjoyable one, and I had the opportunity to listen to the 9 pitchings of the NewMan’s BA. Skopje is one of the nicest cities of South East Europe. It has a unique open-air museum where you see hundreds of monuments and sculptures on the streets throughout the city. The Vardar River, which flows through the middle of the city, is beautiful! The city lights at night are marvellous! If you are dreaming of walking hand-in-hand with your special someone under a light snow, then Skopje is possibly the only city where you can live this dream with all its intensity and translate your dream into reality. Ranked as the fourth ‘best reformatory state’ of 178 countries ranked by the World Bank in 2009, Macedonia has undergone considerable economic reform since independence. The country has developed an open economy with trade accounting for more than 90% of GDP in recent years. Since 1996, Macedonia has witnessed steady, though slow, economic growth with GDP growing by 3.1% in 2005. This figure was projected to rise to an average of 5.2% in the 2006–2010 period. The government has proven successful in its efforts to combat inflation, with an inflation rate of only 3% in 2006 and 2% in 2007, and has implemented policies focused on attracting foreign investment and promoting the development of small and medium-sized enterprises (SMEs). The current government introduced a flat tax system with the intention of making the country more attractive to foreign investment. The flat tax rate was 12% in 2007 and was lowered to 10% in 2008. Despite these reforms, as of 2005 Macedonia’s unemployment rate was 37.2% and as of 2006 its poverty rate was 22%. Macedonia has one of the highest shares of people struggling financially, with 72% of its citizens stating that they could only manage on their household’s income ‘with difficulty’ or ‘with great difficulty’, though Macedonia, along with Croatia, was the only country in the Western Balkans to not report an increase in this statistic. Corruption and a relatively ineffective legal system also act as significant restraints on successful economic development. Macedonia still has one of the lowest per capita GDPs in Europe. Furthermore, the country’s grey market is estimated at close to 20% of GDP. The unemployment rate in the city was 14.07% in 2002, which is lower than the national unemployment rate of 19%. Also as of 2002, the city has roughly 64,000 companies.To address economic challenges, the city relies on integration in preferred economic areas. It is focused on the clean-up of factories, education and development of tourism programs, and the use of tax-free economic zones such as Bunardzik just outside of Skopje. In addition to services, Skopje has many factories. The most important industrial activities are the processing of metals, chemicals, and textiles, as well as printing. Notable companies based in Skopje include ArcelorMittal Skopje, Oil Refinery, Alkaloid, Titan cement plant, and Skovin Winery, among others. The Macedonian Stock Exchange, which is the principal stock exchange in the Republic of Macedonia, is located in Skopje. It was established in 1995. It is a Macedonian-American company for professional executive education, career development and business-technical support, with offices both in Skopje and Los Angeles. Co-founded by Ms Irena N. Chaushevska, it serves start-ups who are looking to expand their businesses and reach out for the finance needed to grow their businesses. 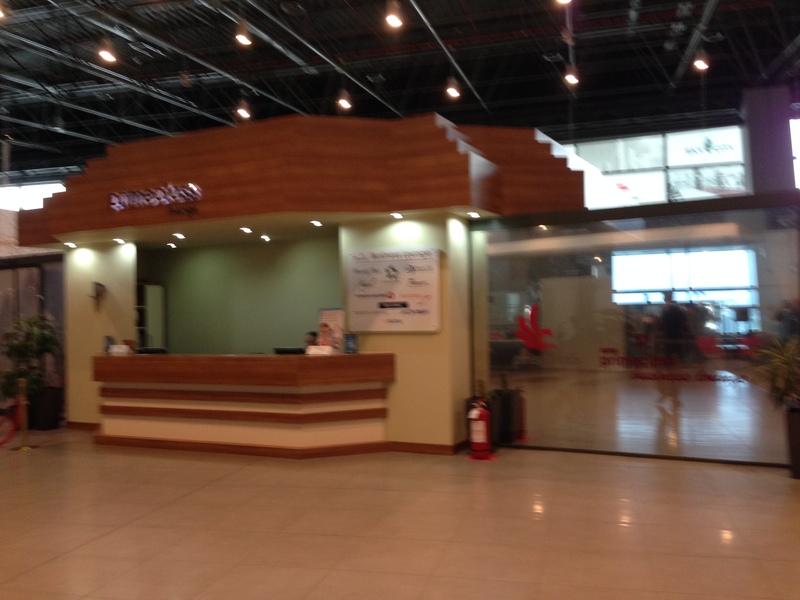 It comprises the following departments: Career Centre, Cloud Academies, Smart-up Centre and Open R&D Lab. NewMan’s name was inspired by Maxwell Newman (1897-1984), British professor, mathematician and hacker, as well as mentor of the famous Alan Turing. His work in 1943 led to the construction of COLOSSUS – the first operational electronic computer. Newman was also the founder of the Royal Society Computing Machine Laboratory at the University of Manchester. I was taken by taxi to Skopje from Pristhina. It was a pleasant 90-minute drive from Kosovo to Macedonia. Crossing the border took just 5 minutes. This was my first time to travel from one country to another by car. The Albanian taxi driver, who had studied theology in Syria, spoke very good Turkish, so we had a good discussion about everything in the world. 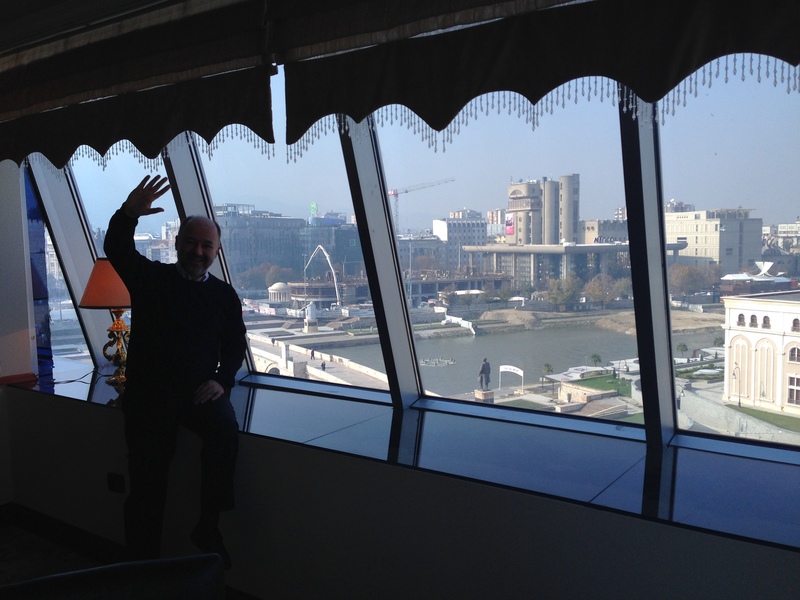 On my arrival in Skopje, I was surprised by the city. Skopje is particularly beautiful at night, when the hundreds of monuments and sculptures are all lit up, welcoming you and making you feel as if you are part of an open-air museum. 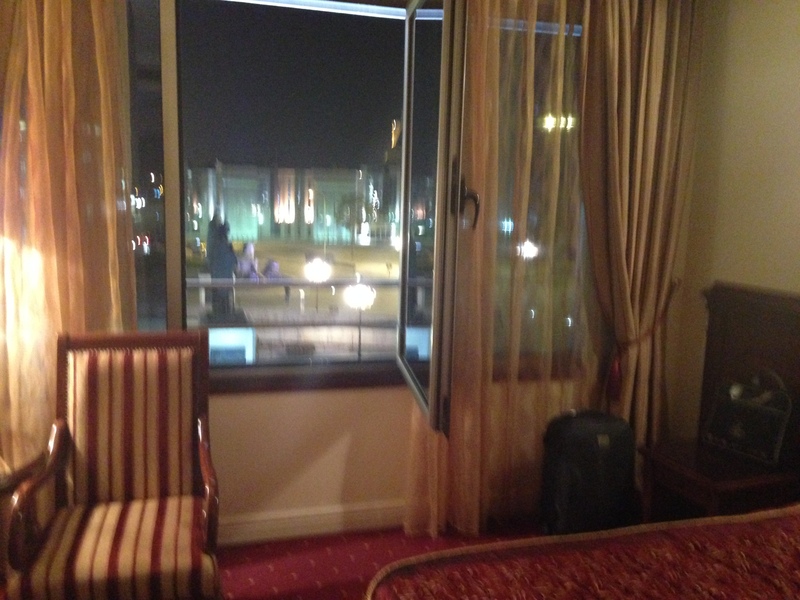 My booking was made for the Stone Bridge Hotel, just near the Vardar River in the downtown part of the city. When I arrived at the hotel, Ivica Penic of Croatia was waiting for me. The hotel had 5 stars, but I think that must have been a hundred years ago because it was certainly not at 20th-century 5-star hotel. Would I stay in the same hotel again? No, because I think there are surely better hotels with better views. Its location is good, but that is all. Around 8pm, Irena came with her Austrian friends, Mike and Christine. Mike and Christine are very cordial people supporting the innovative thinking capacities of people and companies. Mike was originally a journalist but is now an expert on innovation in Munich. Christine’s story is different. She was born in South Africa, raised in Egypt by her Greek parents and now lives in Munich. Irena, Ivica, Christine, Mike and I started touring Skopyje’s downtown with the help of Google maps. Thanks to the internet, we managed to find our way until we located a person who would show us the way to places we wanted to see. Because Ivica had just moved from Croatia to Macedonia, he had an excuse for not knowing his way around, and because it was the first visit to Skopje for me, Christine and Mike, we too had excuses. Irena also had an excuse because she was trying to show Skopje to people who all had excuses. So, the only one we could not blame was Google maps. An hour later we found Davor, the president of student club of the biggest university in Skopje. He is a very active student and he took all of us to a wine house where Christine wanted to dine in another restaurant because she wanted to drink wine only. 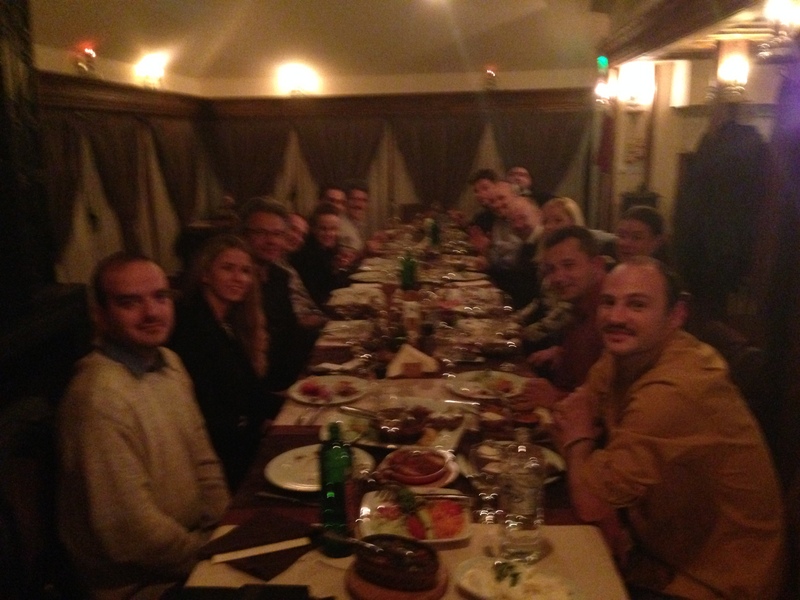 Prof Vladimir Trajkovikj, a partner of New Man’s BA joined us for dinner. 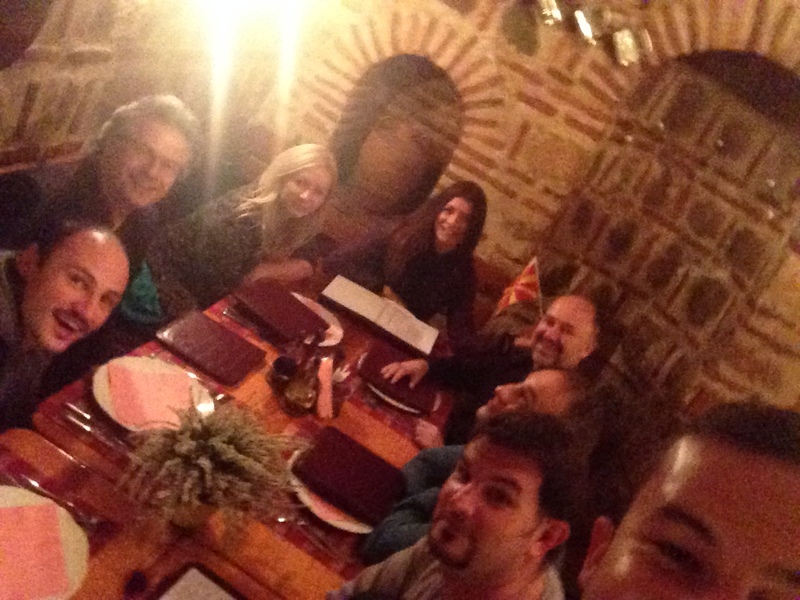 Then we moved to a nice Macedonian restaurant with excellent cuisine. For me, it was easy to understand the menu because the names of some dishes were the same as in Turkish. It was also easy for Christine to understand the menu easily, because the names of Turkish and Greek dishes are essentially the same. So a given dish turned out to have the same name in Turkish, Greek and Macedonian. With so many owners using the same namesJ, I think Umberto Eco should add a new chapter to his semantics theories. How can a single word in different languages refer to the same thing? The weather was a bit cold but fresh. Mike left because he was tired but the rest of us went to a disco. I don’t know why we went to disco in the middle of the night, but we did. We drank water at the disco so we felt all right. If we hadn’t gone to the disco, we would have felt very bad, I am sureJ. Around 1.30pm, I was back at the hotel and had a very nice sleep, using 3 pillows. I got up around 8am and had a non-remarkable breakfast on the 6th floor of the hotel, from where the view of the city is very nice indeed. I wanted to have a walk around, and at noon Irena took me up the hill. After half an hour’s drive, we reached to top of the hill of Skopje with the aim of taking in a panoramic view of the city while enjoying a coffee. But sadly, the hill was closed. In Skopje, hills are closed on some Mondays and that Monday was one of them J. So, we had a look at the view from the garden and then decided to have our coffee downtown. That turned out to be a great chance to practice creative thinking. Watch it from up in the hills, drink your coffee when you get down the hill and connect these two actions in your brain J. If you are going to be a new man, you have to follow the methodology of the New Man. During the coffee break, our Austrian friends and Professor Vladimir joined us. After having a toasted sandwich and an espresso, we moved on to the New Man’s Business Accelerator to give an interview to Sitel TV. During the event, I also found the opportunity to chat with my dear friend Ilija Vuckov. He is one of EBAN’s first members and was the organiser of last year’s business angels week events in Macedonia. He is now supporting start-ups as the mentor of the New Man’s BA. I am on the board of Super Founders, based in Macedonia. This is an initiative of Aleksander Tasev, one of the great contributors to the European entrepreneurship ecosystem. He is also the president of the Balkan Ventures Forum, the biggest entrepreneurship event of the South East Europe. I call him not only Aleksander Tasev, but also ‘Alexander the Great’. He is now initiating a 32-million EUR fund to invest in start-ups in the Balkans. The meaning of the surname of Irena is ‘Ottoman army officer’. On one hand we had Irena N. Ottoman Army Officer, on the other, Aleksander the GreatJ So, the united powers of them would be wonderful for Macedonia. Does it come true? You have to read the back cover of my book to find out. My philosophy is that the world is a great platform where every dream can come true. I believe that if Super Founders and New Man’s BA can act together in the ecosystem, they will create a very valuable impact on start-ups in the region. We listened to pitchings of 9 start-ups incubated in the centre. Because it was a 6 months baby, business model and market perspectives were not available in the video-pitchings. But I liked the ideas of 3 start-ups and committed 50,000 USD to invest in them. I am now looking forward to receiving their business plans and business models to review. After I review them and do my own due diligence, I will invest in these start-ups via New Man’s BA. If I don’t find the desired value after studying the business plans, they will have to forget about the $50,000 USD. What a nice finale! We sang Turkish, Greek, Macedonian songs together. I found the song that Macedonian singers sang that night on Youtube. This song was Atatürk’s most favourite song. The atmosphere in the restaurant that night was very similar to the atmosphere in the clip, which you can watch now. After the dinner, Irena took us to our hotel. She didn’t use Google maps, but she did find the way this time. Michael Gold, Ilija and I were in the car. On the way to the hotel, it was amazing to listen to a great idea of Ilija, which is to use the power of women to foster the entrepreneurship ecosystem. Guess which women? Ambassadors’ wives. He is now setting up an Ambassadors’ Wives Association. I think we may be competing with each other in the very near future because he doesn’t know I am setting up similar association: Ambassadors’ Secretaries Association. We will see whose association turns out better workJ. After Irena dropped us off, Ilija and I talked about future projects. It wasn’t until about 2am that I went to bed. Here is an interview with me about New Man’s BA. 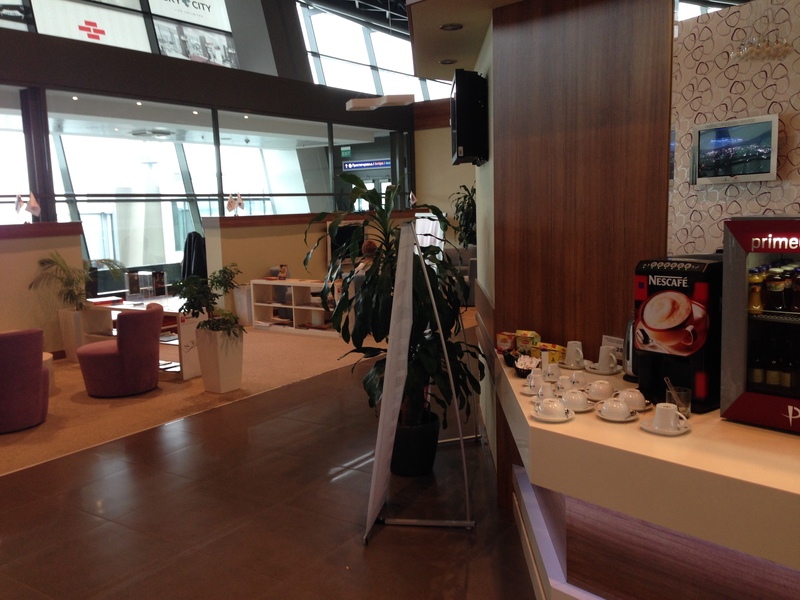 By the way, BA stands for Business Accelerator, not Baybars AltuntasJ.